Seabourn pioneered small-ship, ultra luxury cruising, and continues to represent the pinnacle of that unique style of travel. Its fleet of intimate, all-suite ships, carrying between 458 and 600 guests each, sail to the world’s most desirable destinations at their peak seasons. 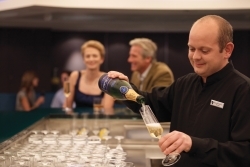 On board, guests are served by an award-wining crew numbering nearly as many as the guests, hand-picked and extensively trained to deliver Seabourn's signature style of thoughtful, personalized and heartfelt hospitality. Seabourn's ships attract accomplished people who enjoy traveling well, and sharing fun and adventures with other interesting people. 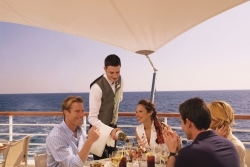 A great many of them have found the Seabourn cruise experience to be their preferred method of travel, and return regularly to sail with us again and again. We would welcome the opportunity to explore whether that might be true for you. In 2009, Seabourn again raised the bar with the debut of Seabourn Odyssey, hailed as “a game-changer for the ultra-luxury segment.” Although larger than the original Seabourn sisters, Seabourn Odyssey carries just 458 guests and offers a wealth of amenities made possible by the highest ratio of space per guest in the cruise industry, including the largest spa on any luxury ship and generous private verandas on 90 percent of her suites. Seabourn Odyssey has since been joined by two identical sisters, Seabourn Sojourn in 2010 and Seabourn Quest in 2011. Our first 600 passenger ship, Seabourn Encore, was delivered in 2016 and a second 600-passenger ship, Seabourn Ovation, is scheduled to be delivered Spring 2018.